As the planet warms, scientists have observed a radical disruption in the geographic distribution of thousands of animals and plants, which has unknown consequences for species survival. William Godsoe, postdoctoral fellow at the National Institute for Mathematical and Biological Synthesis, studies the statistical relationships between a species ecological requirements, or niche, and its distribution, which offers a way to predict and mitigate ecological challenges facing the plant, such as climate change, habitat loss and species invasion. Key to Godsoe's research is making the connection between mathematical understanding of a species' ecology to observational data about where species live. "Many studies attempt to understand an organism’s environmental requirements by modeling its distribution. This method makes use of a lot of data that is easy to collect, but many of the resulting models are hard to interpret because they are disconnected from ecological theory," Godsoe says. "I see my work as a way to foster connections between modern models of species distributions and our mathematical understanding of ecology." To bridge the gap between ecological theory and mathematics, Godsoe uses probability theory to model the relationship between the probability that an environment is suitable and the probability that an organism will actually be present in that environment. Godsoe most recently completed a Ph.D. in biology at the University of Idaho, Moscow. His dissertation research focused in part on the Joshua tree, which can only reproduce with the assistance of its yucca moth pollinator. 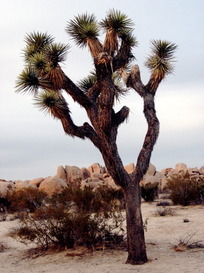 Godsoe's research showed that the two varieties of the Joshua tree have similar climatic requirements across different environments. Ultimately, Godsoe hopes his research will make it easier to understand how environmental requirements shape species distribution. "This in turn will make it easier to predict how environmental problems will affect other organisms," he said. Originally from Ontario, Canada, Godsoe's background is rooted in natural history. At 16, he was trained as a naturalist and interpreter in Algonquin Park, Canada. "A lot of my research is based on observations from my time as a naturalist. I’m particularly fascinated by the fact that good naturalists often have an uncanny ability to figure out which organisms will be found at a particular habitat or location," he said.